York Curiouser works with the University’s staff and students and will feed into the University’s Festival of Ideas in June 2015. The City Council has funded York Curiouser , and its officers are working with the project to provide help and advice. Arts Council England is our major funder, through an award from Grants for the Arts. The National Centre for Early Music funds York Curiouser. Their beautiful churchyard was a site for a York Curiouser installation in 2014, and their auditorium will host one of our events in the June 2015 Festival of Ideas. 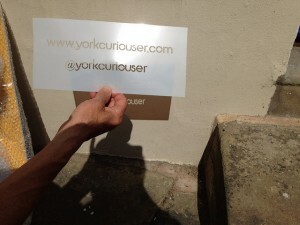 The Friends of York Walls funds York Curiouser. They worked with the project on installations at Fishergate Postern Tower and the Red Tower in 2014. The Foss is York’s second river, often overlooked but beautiful and diverse, even in its short urban section. The River Foss Society is helping us to look for opportunities for artists to work here.